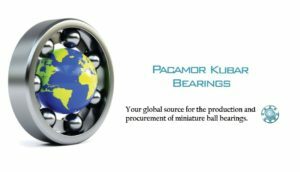 Pacamor Kubar Bearings(PKB), is an industry leader in the manufacturing & development of precision and miniature ball bearings. We supply bearings for nearly every industry, including aerospace and defense, aviation, medical, commercial and industrial. PKB is proud to be a veteran-owned company that manufacturers every bearing in-house, using only DFARS-compliant material. We conform to industry leading manufacturing processes and quality control, striving to be one of the leading OEM suppliers in the world. Our quality department also has an in-house Designated Manufacturing Inspection Representative(DMIR), to assist in advancing FAA-certified aircraft bearing shipments. PKB manufactures a wide variety of specialty ball bearings for space vehicles, satellites, cryogenics, gyroscopes, guidance systems, drones, avionics instruments, and flow control units. Our bearings are used in extreme environments, and in many challenging aerospace and defense applications, all over the world. We’re proud to be involved in such-projects, including the James Webb Space Telescope and the MARS2020 rover. PKB manufactures cryogenic bearings for the involvement of air calibration for many types of gasses and liquid cryogenic applications. Certain liquid cryogenic liquids such as LIN, LOX, LAR, LH2 and others require special ball bearing materials and customer design considerations, which Pacamor Kubar is able to provide. PKB engineering processes these special design features for maximum performance and reliability. PKB is a trusted name in high-precision OEM and replacement miniature ball bearings for commercial, private and military aircraft and aerospace systems. Whether the device is used in a manned or unmanned aerospace flight system or a private aircraft, PKB offers uncompromising reliability, delivered when you need it. Also, by utilizing our FAA-certified DMIR, we can expedite our aircraft bearing shipments. Pacamor Kubar also produces ultra-high-speed bearings which are found in many strenuous applications. 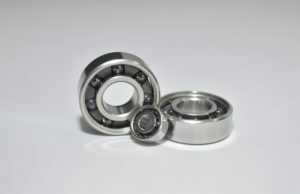 These bearings are able to withstand repeated exposure to autoclave environments, while also being capable of reaching very high RPM’s. For high-speed bearing applications, bearing noise, vibration, and bearing life are all important factors considered in the manufacturing process. We produce all of our bearing rings out of 440c Stainless Steel, but don’t hesitate to inquire about other materials. We also offer multiple retainer materials and specialty ball materials, coatings, and closures, to meet the specific requirements of your application(s). 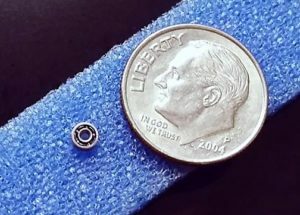 Our miniature and specialty ball bearings are available in standard-inch sizes and various metric sizes. With over 40 years of experience, Pacamor Kubar Bearings (PKB) is a trusted name in miniature and instrument bearings, full-complement ball bearings, angular contact bearings, and thin-section bearings. As an American owned and operated small business, we have the flexibility to respond rapidly to your needs. Our manufacturing facility is located in Troy, New York, and we’re proudly Veteran-owned and operated. PKB is able to meet all DFARS domestic manufacturing requirements pertaining to military and defense contracts. Pacamor Kubar Bearings holds ISO 9001:2015/AS9100D and FAA TSO-C149 Aircraft Bearing certifications.